Satiate your yearning for an escapade to a hill station with a visit to the heavenly paradise of Ooty. With plenty of natural beauty to be discovered it is better to plan your itinerary covering the most important places to visit in 3 days in Ooty for a delightfully restorative tour experience. Cosseted by attractive waterfalls, verdant vegetation and a misty landscape the town is a tourists’ delight. The Toda Hamlet offers unforgettable insights into the distinctive social and cultural identities, beliefs and customs of the Toda tribes that dwell in the Nilgiris. It is Interesting to learn about their traditional attire, intricately designed jewellery and distinguished typical huts made of bamboo. 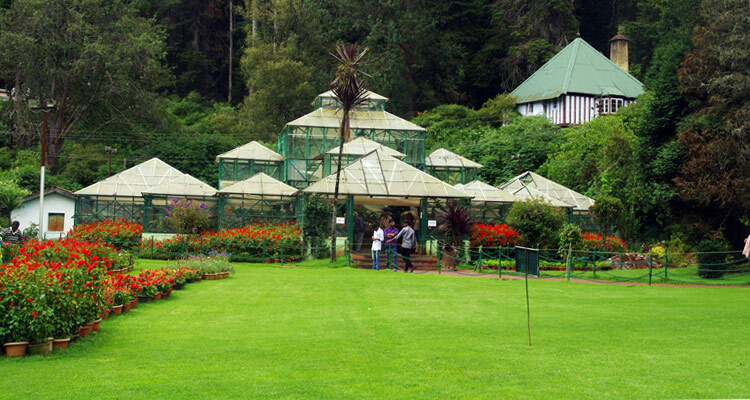 A Standout among the major places to visit in Ooty, the Botanical Garden offers travellers the jaw dropping experience of commuting with nature. The highly diversified botanical garden designed by William Graham Mcivor in 1847 houses more than 200 varieties of blooming plants including balsams, zinnias, verbenas, petunias, salvias and French lilies. Another key attraction among the places to visit in Ooty includes the Wax World located in a 130 year old colonial mansion. The Informative Wax World has wax creations of Indian freedom fighters like Mahatma Gandhi, Bal Gangadhar Tilak, Gopal Krishna and Gokhale as well as social figures like Mother Teresa and our former President Dr. A.P.J Abdul Kalam. Sim’s Park located at 4km from Coonoor railway station brims with abundant scenic views to entice and amaze you. Perched at a height of 1780 meters, it is divided into 8 sections and exhibits colourful flower beds, lawns and rockeries. Among its gems are Araucaria, Quercus, Pheonix, Camellia, Pine and Turpentine trees. The 12-hectare garden has a glass house that accommodates diversified ornamental plants and flowers. The magnolias erupting in vibrant pink and white flowers are a feast to the eyes. Home to the Impressive collection of economic trees like Rudraksh bead tree, Connamomm Queensland karry pine, the wonderful park was developed by Mr. J.D. Sims and Major Murray in 1874. The Glimmering tea estates have been widely visited by traveller’s especially avid tea lovers to enjoy the incomparable aroma of their favourite brew. Visitors would enjoy taking a leisurely stroll through the sprawling tea estates. They also get an intimate understanding of how the exotic tea is processed. The Majestic picturesque spot of 9th Mile is located exactly 9 miles from Ooty. Also renowned as Shooting Medu, where “medu” means hill in Tamil has been the preferred choice of filmmakers. Famous movies like Raja Hindustani, Deewana, Kannathil Muthamittal and Ashiqui have been shot here. The relaxing ambience, surrounding hills and beautiful mountains has been inspiring a wealth of visitors. A well known sightseeing spot, Lamb’s Rock proffers splendid views of the sweeping vistas enveloping it. It was collector Captain Lamb who tried discovering a route to this enchanting place and henceforth became popular as Lamb’s Rock. Located at 8kms from Coonoor, in Burliar village, the serrated cliff provides fantastic views of the Coimbatore Plains, lush tea plantations and Hulical Ravine on its right. Another natural wonder, approximately 12kms drive from Coonoor, the Dolphin’s Nose is a rocky formation that resembles the nose of a dolphin. Perched at a height of more than 1500 meters above sea level, the rocky headland offers panoramic views of the enchantingly gorgeous Catherine Falls. Visitors would enjoy the mesmerizing route leading to the majestic destination as they traverse through the adventurous hairpin bends. Sprawling tea estates and the gushing streams in the neighbourhood enhance the charm of the place. The Artificial Lake created by John Sullivan is dotted with groves of eucalyptus trees. The Tamil Nadu Tourism Development Corporation acquired the lake in 1973 for its promotion as the major tourist spot and runs a boat house which houses different types of boats including paddle boat, motor boat and row boats for the tourists. The Boat Cruise is the best way to experience the spectacular views encircling the glassy lake waters. Ooty’s Rose Garden is a sight to behold offering more than 20000 varieties of roses. Striking displays of miniature roses, hybrid tea roses, yakimor, polyanthas, ramblers and floribunda is a feast to the eyes. We give you the benefit of choosing packages covering major must-see places to visit in Ooty to make your three day visit most pleasing and rewarding. The Heavenly paradise with its rolling hills, salubrious atmosphere, majestic lakes, and fascinating waterfalls greets visitors for the most spectacular excursion. The tranquilizing moment’s remains carved in your mind forever. Check Our Ooty tour packages, we offer perfect tour package for all the passionate travellers seeking a holiday inspiration as it includes the major enticing and intriguing destinations. Head out for the best excursion ever, choosing from the below packages for a 3 day Ooty tour.